The knife slipped and cut his finger. ナイフが滑り彼は指を切った (cf. cut 1b). She cut her finger with a kitchen. 彼女は包丁で指を切った (cf. cut 1a). He cut his hand on a piece of glass. 彼はガラスの破片で手を切った. 〔+目的語(+前置詞+(代)名詞)〕[cut oneself で] (誤って)〔…で〕身を切る，けがをする 〔with，on〕. I cut myself on the cheek with my razor. うっかりかみそりでほおを切ってしまった. He cut the envelope open. 彼はその封筒を切り開いた. 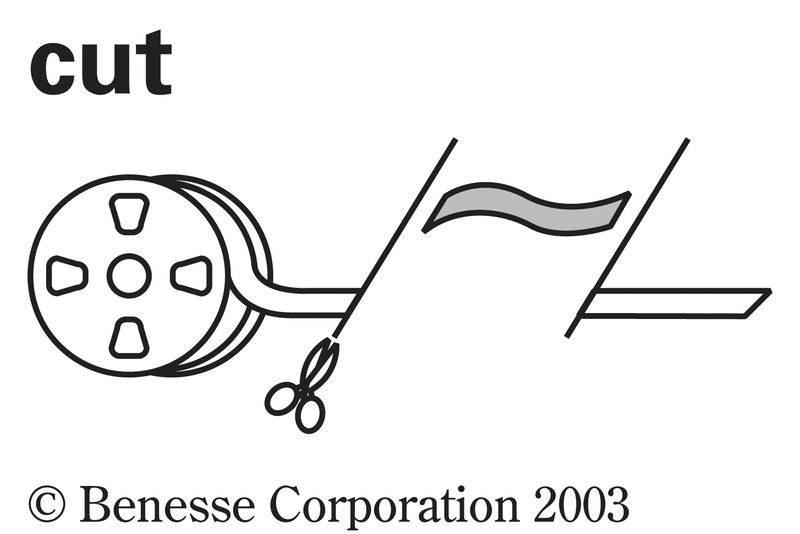 cut the tape [ribbon] テープにはさみを入れる, テープカットをする. He cut the string with a pair of scissors. 彼ははさみでひもを切った. I cut the cake in half [in(to) seven pieces]. ケーキを半分ずつに[7 つに]切った. cut (away) the dead branches from a tree 木から枯れ枝を切り落とす. cut a picture out of a magazine 雑誌から写真を切り抜く. Cut me another piece of pie.＝Cut another piece of pie for me. パイをもうひと切れ私に切ってくれ. I cut the boat loose.＝I cut loose the boat. ボートの綱を切り離した. Let's cut (up) the profits 60‐40. もうけは 4 分 6 に分けよう. have one's hair cut 散髪してもらう. cut the lawn close 芝生を短く刈り込む. cut a person's hair short 人の髪の毛を短く刈る. He cut his initials on [into] the tree. 彼はその木に自分の頭文字を刻みつけた 《★【用法】 文字(など)を深く刻みつける時には into が用いられる》. There was a figure cut in the stone wall. 石壁に刻んだ像があった. cut a road through a forest 森林の中に道を切り開く. 〔+目的語+副詞(句)〕[cut one's way で] 道を切り開く. He cut his way through the jungle with a machete. 彼はなたを振るってジャングルの中に道を切り開いた. Michael Jackson has cut a new CD. マイケル ジャクソンは新しいコンパクトディスクを吹き込んだ. They cut his salary by ten percent. 彼の給料を 10 パーセント切り下げた. Automation will cut production costs. オートメ化すれば製作費を切り詰められるだろう. They cut down the price by half during the sale. 彼らは大売り出しの期間中その値段を半値にした. Postal deliveries are being cut (back). 郵便配達の回数が減ってきている. Several scenes have been cut from the original film. いくつかのシーンが映画のオリジナルからカットされた. You had better cut your speech in several places. 君の演説は数か所削るほうがよい. cut whiskey with water ウイスキーを水で薄める 《★グラス(など)についだウイスキーを薄める場合と, 瓶やたるに入っているウイスキー全体を(違法に)薄める場合とがある》. cut off a relationship 関係を絶つ. 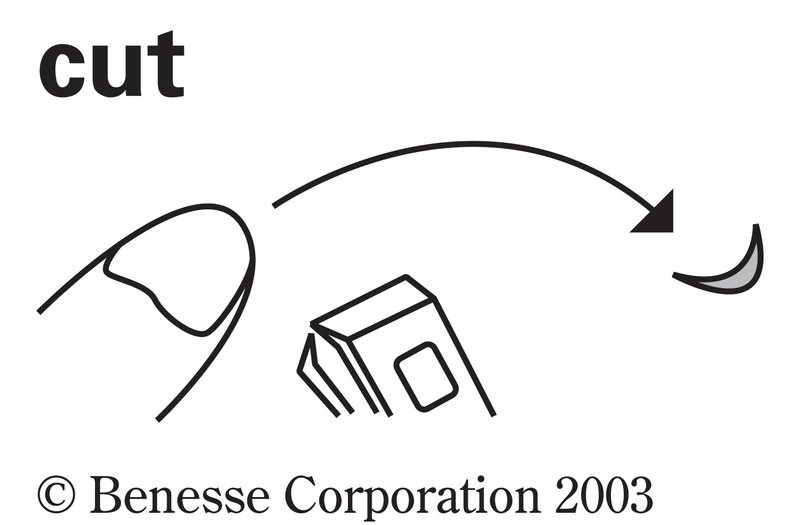 cut (off) the (supply of) gas [electricity] ガス[電気](の供給)を止める. cut (off) an engine [a switch] エンジンを止める[スイッチを切る]. She cut me off in mid‐sentence. 彼女は発言の途中で私の言葉をさえぎった. He sometimes cuts me when he sees me. 彼は私を見かけても時々知らんぷりをする. [cut a person dead [cold] で] 〈人に〉知らぬふりをする. I talked to her but she cut me dead [cold]. 彼女に話しかけたが知らぬふりをした. The cold wind cut me to the bone. 冷たい風が骨までしみた. His remark cut me to the quick. 彼の言葉は胸にこたえた. He cut at the enemy with the knife. 彼はそのナイフで敵をめがけて切りつけた. The bridal couple cut into the wedding cake. 新郎新婦はウェディングケーキにナイフを入れた. This razor won't cut. このかみそりはどうも切れない. This knife cuts well. このナイフは切れ味がよい. Butter from the fridge doesn't cut easily. 冷蔵庫から出したてのバターはなかなか切れない. The ship cut through the waves. 船が波を切って進んでいった. A truck cut across the road in front of my car. 1台のトラックが私の車の前を横切っていった. We cut through the woods to get home. 森を突っ切って家に帰った. The wind cut like a knife. 風は身を切るように冷たかった. The wind cut through her thin clothes. 風は切るように薄着の彼女の肌を刺した. The remark cut deep. その評言は痛烈にこたえた. His insight cut to the heart of the problem. 彼の洞察は問題の核心をついた. I('ve) got to cut out now. じゃあもう行かなくちゃ. The boy cut away through the side gate. 少年はくぐり戸から走り去った. He cut out of the party. 彼はパーティーからさっと姿を消した. I cut over to [over, into] the lefthand lane. 私は急に左の車線に入った. A truck cut in front of my car. トラックが 1 台私の車の前に割り込んできた. 【トランプ】 札を切る (⇒ 他動詞 12). I made a cut at the log with my axe. おのでその丸太に切りつけた. He gave the horse a sharp cut with his crop. 彼は馬をむちでピシッとひと打ちした. I got a cut on the left cheek while shaving. ひげをそっているうちに左のほおに切り傷をつけた. a one‐percent cut in income taxes 所得税の 1 パーセントの引き下げ. a cut of beef [pork] 牛[豚]肉の切り身. a suit of poor cut 仕立てのよくないスーツ. 近道 《★通例 short cut という》. The remark was (intended as) a cut at me. その言葉は私への当てつけ(のつもり)だった. He wanted to take a 50% cut of the profits. 彼はもうけの 50 パーセントをもらいたいと思った. 可算名詞 【トランプ】 札を切り分けること (⇒ 他動詞 12); 切り番; 切って出た札. I will cut the birthday cake. Don't cut the tree down. They use special scissors to cut cloth. Cut the onion into as many pieces as possible. The cook cut the meat into large chunks. I cut her a piece of cake. His words were cut short by a big noise. She cut the engine and got out. The city's water supply was cut for a few days by the disaster. Japan cut diplomatic ties with the country. If you keep cutting classes, your grades will suffer. It was clear that she recognized me, but she cut me. The coffee's very strong. Cut it with milk. The hand soap cuts grease and removes it from dirty hands. Use the nail scissors for cutting fingernails. I had my hair cut short. Bob has cut the grass every week all summer long. The player cut his amateur career when he joined the professional team. I cut the article from a newspaper. The film was cut for TV audiences. The sponsor insisted that some of the violence be cut from the movie. The store cut the price of winter clothing by 20%. The company decided to cut 100 jobs from its 1,500‐strong work force. He cut his knee on a stone when he fell. I cut myself while paring the potatoes. He cut the box open with scissors. She cut the carrot to look like a flower. Cut the pumpkin to make a face. I had to cut another hole in my belt. She cut a hole through the tablecloth. After the heavy rain, a deep ditch was cut in the earth by running water. They cut a passage through the hill for a railroad. The chilly wind cut me from all sides. The accusation cut me like a knife. The choir cut a CD for charity. 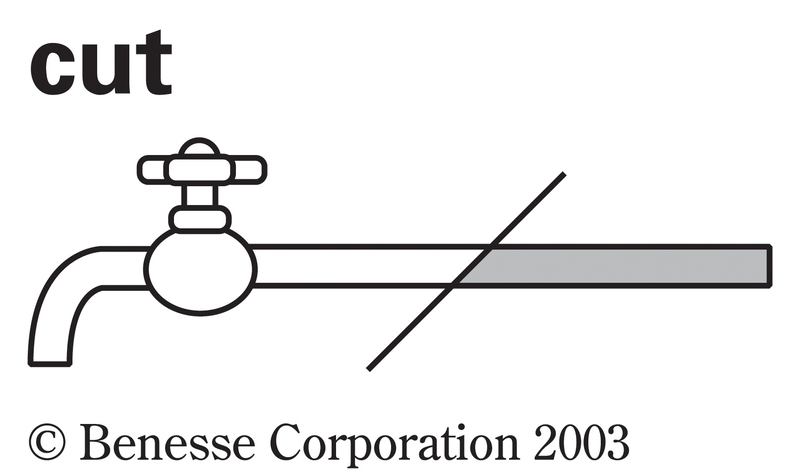 The line cuts another line at point A. He cut very bad jokes on my picture. The grass needs a cut before I go on holiday. They charge only $20 for a cut and shampoo. I've got a cut in my foot. The cut was too deep for time to heal it. I'm looking for a new hair cut. The company announced more job cuts for the next year. The author made several last minute cuts to her book. She bought a small cut of meat. Her cut of her father's estate was 20%. The cut was made to shorten the route. Their debut album contains twelve cuts. He failed because he had too many cuts. The cut of lumber that year was 2,000 tons. Look at that player. He is definitely a cut above the rest. If you can't make the cut, you shouldn't take this special training course. I would hate to experience the cut and thrust of politics. Chrysanthemums are popular as cut flowers. Roots can grow from a cut end of a stem. They give a cut rate if we have 10 people. Even a cut finger could give you tetanus. The blade cut deep into the flesh. That knife doesn't cut well. The material cut easily with scissors. The engine cut off finally, and the plane glided slowly toward the earth. Would you like to cut before I deal? The river cut through the city before entering the sea. The wind cut through me. The player eluded a tackle by cutting to the left. He cut in front of us as if we weren't there. Don't cut across our lawn. The environmental problems cut across all levels of society. You need to rewrite your letter. Cut away all the unnecessary words. One little goat cut away from the rest of the herd. I plan to cut back the time spent watching TV. I must cut back on our household spending. All the shrubs need to be cut back. I was sorry we had to have the old trees cut down. Production at the factory was cut down by one half. They were cut down in the prime of their lives. If you can't quit smoking, at least cut down on the amount. Don't cut in when someone else is speaking. A news bulletin cut in on the regular program. Would you like to be cut in on this deal? The engraver uses a special tool to cut into the metal surface. The sword cut into my thigh. The importation of the new products cut into the domestic industry. He almost cut off his finger while sawing. We got cut off just when she said, “Hello." They got cut off from the rest of town when the bridge collapsed. I cut the picture out of the page. I'm trying to cut out some of the fat from my diet. The boy cut out pumpkins from orange colored paper. The drapes help cut out the sunshine. The pioneers cut out a road from the town to the lake. The coach cut him out of the line up for today's game. The engine cut out and then wouldn't start again. He isn't cut out for a teacher. The new road will cut through the middle of our farm. The knife cut through the wall. Cut the onion up in small pieces. He's all cut up about getting fired from his job. When he fell from his bike, he was cut up rather badly. She cut me dead at the party. He cut himself free from all his social duties and became a hermit. Cut it out! Go outside if you must play ball. He cut himself off from his friends long enough to finish his book. That knife doesn't cut well. Use this one; it cuts well. The material cuts easily with scissors. Don't grab the stone. It cuts. The director yelled, "Cut", when they all started laughing. The river cuts through the city before entering the sea. I cried all night because his words cut so deep. Cut the apple in half. Diamond gems are cut in many different shapes. Venezuela cut diplomatic ties with Great Britain in 1887. It was clear that she recognized me, but she cut me dead. I wish I could cut my own hair. The player cut short his amateur career when he joined the professional team. Cut the sentence from the document and paste it in here. I like to watch the farmer cut the wheat. I knew she had a weakness for cake, so I cut her a piece. The film had to be cut for TV audiences. The family was obliged to cut expenditure on education. I decided to cut paper use up to 50%. The company decided to cut 100 jobs from its 1,500-strong workforce. He cut his forehead open when he ran into a door. Be careful not to cut yourself with that knife. The ice is too large for the glass. Cut it smaller. The craftsman is good at cutting patterns into the surface of glass. The Japanese opera singer cut her records abroad. You can cut your favorite shots on a CD-ROM. Cut a CD-ROM if you want to protect crucial data. Jane cut at the heavy blackberry vines growing along the fence. We need an ax to cut away the knotty parts from the wood. I hate to see someone cut in and out of traffic. The government feared that the importation of the new products would cut into the domestic industry. Don't cut off the water just yet. They need to cut off the flow of drugs from South America. We got cut off just when she said, "Hello". She was cut off from her family after joining a cult. After quitting her job, she felt cut off from all of her friends. His father warned him that if he refused to take over his business, he would be cut off without a penny. The doctor cut out her tonsils. I'm trying to cut out some of the fat from our diet. The editor suggested to the writer that he cut out part of the story because it was too violent. He is cut out for a teacher. Grandpa had no qualms about cutting his son out of his will. Jack cut me to the quick when he told me he didn't want to see me again. Some babies cry a lot when they cut their teeth. He cut his teeth as an actor by playing the part of the heroine's boy friend. In his twenties, he won the literary prize and took the cut and dried path to success. The answer to her question was pretty much cut and dried. When they told him to produce more work, he cut and ran. Your vetoes cut both ways. Don't cut corners building my new house. I guess we cut her down to size. Her words cut no ice with me. If you take a bus, you'll be there just on time, but you may be cutting it a little fine. Why don't you take a taxi? Giving up your best friend because you are angry with her, is like cutting off your nose to spite your face. She cut her own throat by speaking out at the wrong time. The soldier cut his way through the enemy's line. I wasn't cut out to be a nurse. As the negotiations broke down, the diplomat had to cut his visit short. Pneumonia cut short his career when he was 37. He had to cut her short, because she talks incessantly. You know what mother always said, "Cut your coat according to your cloth". I know how you operate. Don't try to cut the ground from under me. You had better cut your losses and get out of this business. All our products are available in full size or can be cut to size. The students cut up so badly that she called the principal. He cuts up rough when his wife gets home late. My grandmother cut up big for me. 【３】 切り取る, カットする《指定対象を現在の場所から削除してバッファーへ移す; cf. copy》. From Middle English cutten, kitten, kytten, ketten (“to cut”) (compare Scots kut, kit (“to cut”)), probably of North Germanic origin, from Old Norse *kytja, *kutta, from Proto-Germanic *kutjaną, *kuttaną (“to cut”), of uncertain origin, perhaps related to Proto-Germanic *kwetwą (“meat, flesh”) (compare Old Norse kvett (“meat”)). 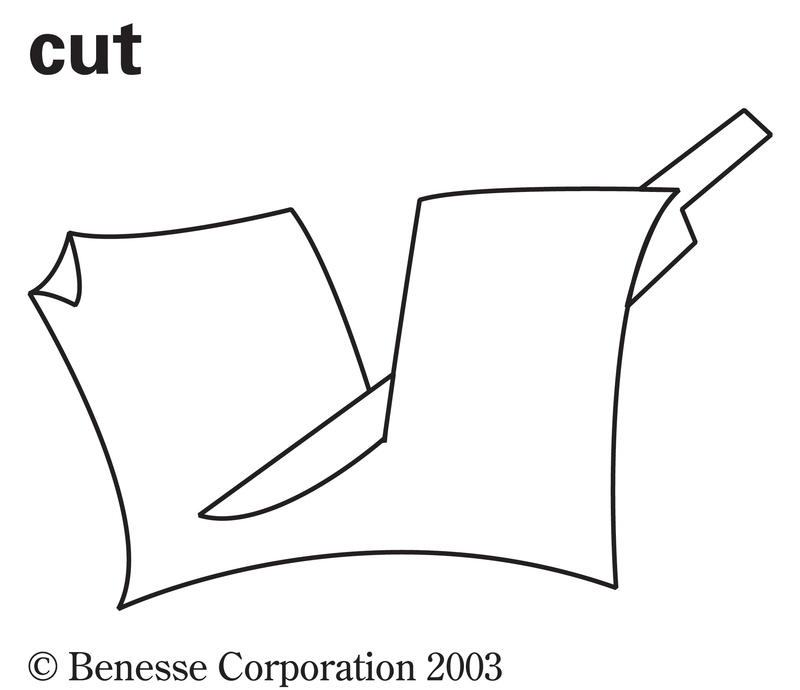 Akin to Middle Swedish kotta (“to cut または carve with a knife”) (compare dialectal Swedish kåta, kuta (“to cut または chip with a knife”), Swedish kuta, kytti (“a knife”)), Norwegian kutte (“to cut”), Icelandic kuta (“to cut with a knife”), Old Norse kuti (“small knife”), Norwegian kyttel, kytel, kjutul (“pointed slip of wood used to strip bark”). Displaced native Middle English snithen (from 古期英語 snīþan; compare German schneiden), which still survives in some dialects as snithe. (sports) To drive (a ball) to one side, as by (in billiards または croquet) hitting it fine with another ball, or (in tennis) striking it with the racket inclined.